Storm In A Teacup - ubiq bookshop: the best place to buy books! 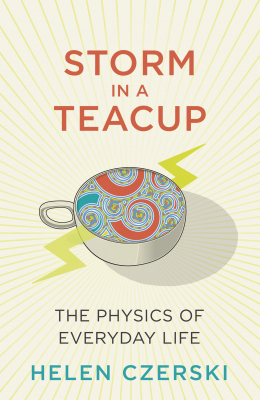 Just as Freakonomics brought economics to life, so Storm in a Teacup brings physics into our daily lives and makes it fascinating. Our world is full of patterns. If you pour milk into your tea and give it a stir, you'll see a swirl, a spiral of two fluids, before the two liquids mix completely. The same pattern is found elsewhere too. Look down on the Earth from space, and you'll find similar swirls in the clouds, made where warm air and cold air waltz. In Storm in a Teacup, Helen Czerski links the little things we see every day with the big world we live in. Each chapter begins with something small -- popcorn, coffee stains and refrigerator magnets -- and uses it to explain some of the most important science and technology of our time. This is physics as the toolbox of science -- a toolbox we need in order to make sense of what is around us and arrive at decisions about the future, from medical advances to solving our future energy needs. It is also physics as the toy box of science: physics as fun, as never before.